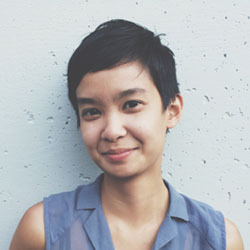 Stacey Tran is a writer from Portland, OR. She curates Tender Table and her writing can be found in diaCRITICS, The Fanzine, Gramma, and The Volta. Wendy's Subway released her first chapbook, Fake Haiku (February 2017). Her first full-length book, Soap for the Dogs, is forthcoming from Gramma (Spring 2018).